A few weeks back, at the quiz night* I host, I read out a question that for some reason proved more difficult than I imagined it would. Now, I write the quiz myself, so carefully pitch the questions so that they are of a suitably difficult nature, but there should be enough of a clue for them to be fair for even the most quiz hating participant; at the very least it should be possible to take a guess. Clearly, ‘Breaking Bad’ was not as well known as I had thought, which is a terrible thing, as it is a gem amongst the dross that TV churns out. What struck me was that not only had they not seen it, but they weren’t even aware of it. For a show of this quality that is surprising, but also highlights the poor marketing, lack of respect for the viewer and lack of respect for the show shown by the TV channels. 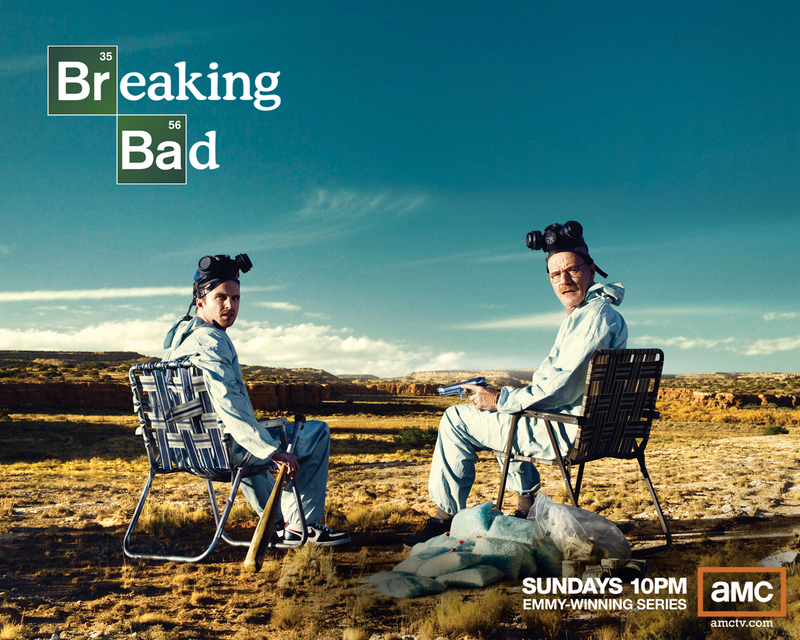 Breaking Bad in the UK has had a patchy run. FX showed the first season, FiveUSA showed the second season and then… nothing. Season 3 got dropped like a hot potato and the latest Season, which got underway in the US recently, is unlikely to be shown. Not a situation you would expect of a show created by Vince Gilligan, who has an excellent track record, well known to X-Files fans. Walter White, a high school Chemistry teacher is diagnosed with cancer and to make sure that his family are taken care of financially, he decides to make some fast money by cooking meth. As he has no connections with this world, he teams up with a drug user and ex-student, Jesse Pinkman and the new venture stutters into life, with huge consequences for all involved. While this premise may seem bleak, and the drama is indeed downbeat and extremely bleak, there is a dark humour running throughout the show that never lets it truly hit rock bottom. The shows greatest asset though is its writing, with perfectly balanced scenes of mundane life and high drama, both moving at a snails pace and then quickly as events unfold. It is a tribute to the actors and the script that the slow pace of many of the episodes doesn’t feel like it’s dragging, but just adds to the tension of plot. So, for something so good, how can it be that it is so unknown in the UK? For some reason, the show has not found an audience, or at least a large audience, in the UK. This could be down to the subject matter, the channel, or it could be down to scheduling. It is quite possible that FX and FiveUSA may not be everyones first port of call for their entertainment, so the channel could well be a factor and scheduling may have had an impact, but I suspect that the subject matter and pacing may have been the reasons. This is a great shame though, as if you allow the slow pace to pull you in, the time spent with it is highly rewarding and much like ‘The Wire’, the depth and quality of the writing continues to reward you on repeated viewings. Unfortunately, many of todays TV companies and viewers favour the fast paced, quick cutting crime dramas, but Breaking Bad is more considered and refined; More Hitchcock than hokey procedural. If you like decent drama, with depth, thought and executed perfectly, get hold of the DVDs and enjoy!